High-level conceptual data models provide concepts for presenting data in ways that are close to the way people perceive data. 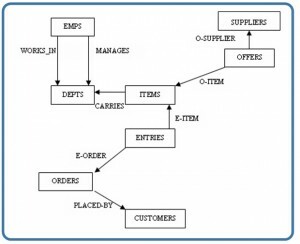 A typical example is the entity relationship model, which uses main concepts like entities, attributes and relationships. An entity represents a real-world object such as an employee or a project. The entity has attributes that represent properties such as an employee’s name, address and birthdate. A relationship represents an association among entities; for example, an employee works on many projects. A relationship exists between the employee and each project. Record-based logical data models provide concepts users can understand but are not too far from the way data is stored in the computer. 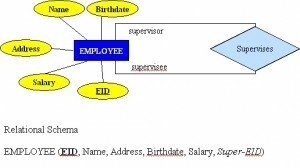 Three well-known data models of this type are relational data models, network data models and hierarchical data models. The relational model represents data as relations, or tables. For example, in the membership system at Science World, each membership has many members (see Figure 2.2 in Chapter 2). The membership identifier, expiry date and address information are fields in the membership. The members are individuals such as Mickey, Minnie, Mighty, Door, Tom, King, Man and Moose. Each record is said to be an instance of the membership table. The network model represents data as record types. This model also represents a limited type of one to many relationship called a set type, as shown in Figure 4.1. Figure 4.1. Network model diagram. The hierarchical model represents data as a hierarchical tree structure. Each branch of the hierarchy represents a number of related records. Figure 4.2 shows this schema in hierarchical model notation. Figure 4.2. Hierarchical model diagram. What is a high-level conceptual data model? What is an entity? An attribute? A relationship? List and briefly describe the common record-based logical data models. Chapter 4 Types of Data Models by Adrienne Watt & Nelson Eng is licensed under a Creative Commons Attribution 4.0 International License, except where otherwise noted.